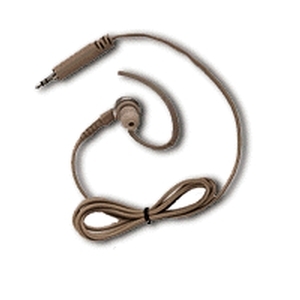 This beige, single-wire surveillance accessory allows the radio user to privately receive messages with the earpiece and is ideal when environments require discreet communication. It is an extra-loud earpiece, which exceeds OHSA limits. This intrinsically safe earpiece requires the 3.5mm threaded adapter jack BDN6676D that attaches to the radio, unless being used with speaker microphone.